The Smurfs 2 is absolutely smurfarrific! Whatever the heck that means. Hah! Thankfully, The Smurf 2 has cut down on such grammar jokes that made the first movie more than annoying. The second film while an improvement is still far from meeting even the lowest of expectations. However, young kids and their parents would still have a good time watching. Hank Azaria as Gargamel and his cat Azrael steals the show again. Though it wasn't hard for them as most of the other characters including Neil Patrick Harris and the new but uninspiring "Naughties" falls flat on their face as if under Gargamel's spell. The story is entirely unbelievable even for imaginary characters, and runs longer than it should. As well, while most of the soundtrack to the film is quite fitting for the Smurfs with its catchy tunes. I was a bit disappointed to the almost entirely auto-tune "Ooh La" by Britney Spears which concluded the movie. It's kind of interesting that Katy Perry who plays Smurfette didn't contribute to the soundtrack. Aside from Gargamel and Azrael, the only other reason to watch the film would be that this was the last film that Jonathan Winters acted, as the voice of Papa Smurf. He passed away in April and the film is dedicated in memory of him. 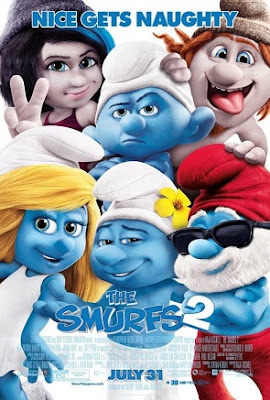 Overall, I would still recommend this to young kids and adults that grew up with the Smurfs. I grew up watching the cartoon and having one of their graphic novels as one of my first books. People tend to forget the targeted audience is not adults, and hence the simplistic slapstick humor you'll find throughout the film. Also it is not necessary to watch the first film to watch this sequel. Christina Ricci as Vexy, a smart and mischievous Smurf-like "Naughty"
J. B. Smoove as Hackus, a funny and physical, Smurf-like "Naughty"